PARIS – A transatlantic balloon voyage is the latest sensation in the aeronautic world. M. Louis Godard, who has made over 700 aerial ascents, proposes to travel through the air from New York to some point undefined on the European or African continent. "The balloon will be provisioned for forty days, and carry arms and ammunition, in case it should land in a barbarous country," he said. ROME – Benito Mussolini, Premier of Italy and fighting leader of the Fascists, has taken up boxing. The Duce, who will be forty-three in June, has been going to the gymnasium since his return from his trip to Tripolitania, and is mastering the rudiments of knocking out an opponent. He is working industriously to develop a sleep producing wallop. His age seems to have no effect on his speed or punch as he thumps the bag or steps a few practice rounds with his instructor. His footwork is developing nicely, and he has already landed a few solid thumps on the anatomy of his coach, who says that the Black Shirt leader carries a punch in both hands. He ranks in the heavy-weight class. WASHINGTON – The Supreme Court refused to review the cases of seven Nazis sentenced to death in Germany for concentration camp atrocities. The refusal clears the way for American military authorities to carry out the executions. The seven Nazis included former SS officers and concentration camp officials accused of murdering thousands of civilians in the war. They are the last Nazis under sentence of death. 1817: Charles Marignac, chemist, born. 1800: The Library of Congress, Washington, established. 1933: The first radio series based on Sax Rohmer's Fu Manchu, starring John C. Daly as the evil doctor, broadcasts its last program. A German lawyer who was hired by a noble family to travel about Europe with their three sons as their tutor. It is said that he taught them more by his good example than by word of mouth. Later in life he joined the Capuchins and went as a missionary to Switzerland, where the Calvinists in the Grisons killed him. According to Lars Kindlefeldt, the great Finnish 'explainiast', two little recognized (at that time) phobias combined forces to give the Lutheran church a 'running start' in the race to see which branch of the Christian faith would 'rule' the people of the Arctic: ecclesiophobia and eisoptrophobia. This morning's Bangkok Daily News shows a bunch of investigators poking through piles of suspect papers. From afar, the stuff looks like US Treasury 'bearer bonds. '1 And, the man seen on the right in the picture might very well be someone called in from Washington ... someone called in to see if the US really owes the 'finder' billions and billions of dollars; or, will the bad news from his lips be that ... "the papers might just have some 'curiosity' value over on e-Bay ... nothing more." Take a close look at his watch ... yes, the man from Washington's watch. Watcharee pointed this out to me. Does it look like a Rolex? Perhaps one that he bought on Bangkok's Silom Road for about $25? 1 "Bearer bonds" pay to bearer (the person who actually has them in his hot little hands ... no matter how he got them) the face amount of the bonds upon their due day. Like the rapid firing of cannons across Pall Mall ... Edward II ... Margaret of Anjou ... William the Silent ... Oliver Cromwell ... Sir Marc ... Keble, the divine ... Cowper the poet ... and, finally, The Princess Royal. They all were born or died in the Mother country! NEWNES, gazing across the channel, allows all of this to the mighty fine sounds of The Marseillaise (1792) ... and, The Guillotine (same year). According to our very own Wescott, Mark the Evangelist, when dead, smelled like "strong-smelling pork". His death was at the hands of men who ran "wild oxen". They "dragged him about the town from morning to night on two successive days". What exactly remained of St. Mark after all this 'exercise of the flesh' is not noted in the Gospels. The whole thing started with a quarrel with St. Paul ... about the nature of 'preaching'. As to who prevailed in the long run, we'll probably never know; being a private argument, 'strange' ears were not privy to the exchanged words of hurt. In the short run ... .well, Paul won. Yesterday (April 24, 2001) I received my 'air mail subscription' copy of the Weekly World News ('newsstandedly' dated April 3, 2001). Coincidentally, yesterday's edition of The Asian Wall Street Journal devoted almost the entire front page of its 'Networking' section to the 'tabloids' ... 'the supermarket newspapers' ... the 'Boca Weeklies'. Kenny Kingston's "The Most Important Phone Call You'll Ever Make"
Hearing Aid Batteries, from Simply Batteries, Inc.
Florida's role in the election? 1 Boca Raton and Lantana, both South Florida cities, are separated by just the teeniest of zip-divides. Coffee cups easily retain their heat as sub-editors walk from head office to head office. 1 Generoso Pope. Under his guiding hand, The National Enquirer regularly lifted five million copies a week into the carts of supermarket 'check-outers'. The edition that showed Elvis in his coffin sold a yet-to-be-topped 7.5 million copies. 1785: John James Audubon, ornithologist, born. The patron Saint of Toledo, called St. Locaie in Flanders. She died of her own volition, in order not to be separated from her martyred friend St. Eulalia. It was she who appeared to St Ildefonso to tell him that his book was being read and admired in heaven; and there is a bit of her mantilla in the cathedral of Toledo which he kept as a souvenir of this unreal meeting. One of my uncles ... the crazy one ... had his fingers in this particular pie. While most young American zealots were signing up to fight for 'democracy' in Spain, my uncle Robert joined (purposely or mistakenly, no one really knows for sure) the 'wrong' queue. Whatever his earlier persuasions, he spent the declining days of WWII looking for space on a submarine to Argentina. That route never materializing, Uncle Bob used a variety of passports to bring him back to an 'Army Surplus' America. Driving a Jeep ... dressed in combat ready cloth ... and always hinting, right and left, of guns ... he was really popular with all of my school friends. Never jovial when V-E Day or V-J Day3 rolled around, he feigned it with a little help from the bottle. His own declining years were passed in a hospital of sorts. Two pictures show the mother rooms of The Oriental still awash in light (positive and negative). Two others, taken shortly after the setting, turn the hotel's western properties ... and, for that matter everything to its west ... into silhouettes. The very zoomed one likens BKK to something flattened and rubbished by a nuclear device. 1 Generic, almost. With several already flying and another laying about in Sian's mind, we're looking for a more descriptive 'maid'. 2 Everyone knows that 'aviophobia' is a fear of flying. Very few know that 'alektrophobia' is a fear of chickens. But, for something in the middle: a fear of birds ... is there no word? Apparently, Bull is not afraid of these things. 3 When did these days finally fall off the calendar? What are they, you ask? Well, "V-E" stood for 'Victory in Europe", while the "J" initialed "Japan". 4 This italicized sentence is competing in the "Elements of Style" competition, the one judged by William Strunk and E.B. White. 1891: Loftus Perkins, engineer and inventor, died. 1907: Birth of James Holding in Pittsburgh, Pennsylvania. Prolific short story writer whose unusual detective, Hal Johnson the Library Fuzz, comes across murders while tracking down overdue library books. A quiet day in Bangkok. "There is a series of buildings on the bank of the Chao Phraya River that include the East Asiatic Company, The Oriental Hotel, The French Embassy, the Taxation Department or Bang Rak Fire Department, the Portuguese Embassy and the Shangri-La Hotel, that stand on a stretch of land that might be called 'Bangkok's Golden District'." Heretofore, my myopic lens has worried about the small stuff: whether the French will get their roof right. A far more laudable U-Fix-It lays just one property to the North. Built during the reign of King Rama V, it started life as the Customs House. While most of the properties surrounding it have prospered through renovation and care, the Fire House has been allowed to fall on hard times. This morning's Outlook section of the Bangkok Post makes a plea for its restoration. My 14th floor lens now has two targets. But, I am doubtful of seeing any changes at the Fire House during my tenancy here at The Oriental. Every Friday the IHT carries a useful section called 'International Traveler'. 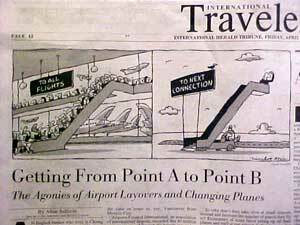 The other day it dealt with the agonies of "Getting from Point A to Point B" ... in other words, 'the agonies of airport layovers and changing planes'. It hit home! In my own mind, I always have half a dozen things playing about in my skull when I start thinking about BKK-MIA or MIA-BKK. How many ways can I cut the deck? First, what are the terms? Non-stop ... direct flight ... plane change ... airline change ... terminal change ... airport change. Reading from left to right, the chance of something going horribly wrong increases exponentially with the crossing of each set of separating dots. "Non-stop" is just what it means. You get on the plane at point A (let's call it 'Yourtown') and you get off the plane at point B (let's call this one, for inconvenience sake, 'Wannagototown').1 This transportation fluke works best if you live in a perfect world. A perfect world, as defined by the airlines, is any world where the carrier's corporate hub is the center of practically everything,2 and the lines that radiate ... in and out of, or to and away from ... this dot-mother of air travel are the airline operated apron strings that bind 'Yourtown' with lots of little 'Wannagototowns'. Incidentally, 'Yourtown' usually does not welcome other mothers; nor is it happy having another's child under its own roof ... they frequently have to suffer with shabbier living quarters and must come and go at stranger hours of the day or night. Non-stop BKK/MIA or vice versa is not an option available to me. As the world now stands, the longest scheduled pairing is JFK to Hong Kong. A direct connection between BKK and MIA is likewise not available. "Change of the First Magnitude." On the way from point A to point B you are required to land at point C and move yourself (crossing your fingers that your luggage also gets the nudge) to another airplane of the same livery as the one that took you from A to C. Here each leg carries its own unique Flight Number. Here there are many options from which to choose. My favorite is Zurich-Bangkok; others are London-BKK, Paris-BKK, Frankfurt-BKK. Flying west doesn't allow this. Getting from Florida to a US west coast exit city eats up a full leg; then the long trans Pacific haul demands at least one refueler. "Change of the Second Magnitude" is the above ... but, the flight that you'll take from C to B is on a bird of a different feather. The same as immediately above ... with the fillip that once in Europe you have a selection of carriers to chose from for the ongoing final leg. Depending upon the airline, this can be awful (Heathrow) or just a long walk (DeGaulle). I've never experienced this hell. But, others I love have tested the ability of the human body to take large doses of all of this. Once, a long time ago, I gave to my friend Susan, a cobbled together ticket that took advantage of every available price shave. It mixed, merged and married all of the following: frequent flyer rewards ... discount weekend layovers ... not blacked out upgrades ... special fares ... promotional offers ... calendar quirks and several other penny savers. The ground floor Fort Lauderdale-Cleveland flight was almost over before it began, as Susan slept through most of it. The Cleveland-Albany leg served coffee. As did the Albany-LaGuardia hop. The taxi ride to JFK was made miserable by a talkative Haitian driver who regularly pulled to the curb to vomit up poisons from the prior evening's fun and games. Kennedy to Luxembourg in Economy was crowded with backpackers. Not so the one to Stockholm or the really scary one to Moscow where the landing was made missing one engine. Three hours going from former Soviet terminal to former Soviet terminal passed by in a near vodka induced coma. The Air India connection to Bombay was smoky (it is mandatory to smoke in the smoking section), as was the leg to Calcutta with its unscheduled 'mechanical stop' in Delhi. Going north to Seoul was out of the way but it allowed for a 'legal' connection to Tokyo. Compass corrected, the Cathay Pacific flight to Hong Kong became another welcome sleeper. Barely making the SIA 747 to Singapore put her in a grumpy mood. Two hours shy of BKK, the flight was diverted to KL. Though the final leg to Bangkok was smooth, Susan was not speaking to anyone by the time she was pointed to the 'lost luggage' desk. 1 In almost all cases this is exactly what the ticket purchaser had in mind when he walked into the shop, money in hand. 3 Or, because of the hub, it became a watering hole. [Atlanta]. 3 Back when PanAm ruled the air, each morning a PanAm #1 took off from New York and traveled completely around the world. PanAm #2 did the same thing in reverse. But, that was a long time ago. NEWNES does not recognize his birth; instead he tells us that Saint Catherine of Siena had this day chosen by her followers as the day on which they would like to remember her with a feast. I found no reference to it in The Bangkok Post. The IHT, too, was silent. As was The Asian Wall Street Journal. And, no murmur from the hotel, quietly slipped beneath the door. Strange! Today is the 2562nd anniversary of the birth of Siddhartha Gautama, the Buddha. It falls on the eighth day of the fourth moon (April 30 for 2001). Adolph Hitler committed suicide in 1945. Yesterday Watcharee and myself and her cousin and his family went to Pattaya for the day. It’s a beach town about 90 minutes from Bangkok. We did very little except paddle around in two-person goose shaped boats and lounge about on the beach.